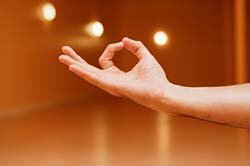 Place your hands on corresponding knees and assume Gyana Mudra(See below). Part your lips keeping the teeth together. Hold your tongue tip against the lower teeth. Inhale through your mouth with a hissing sound. Continue inhaling till your lungs are filled. Exhale through both the nostrils immediately.